Paitec USA makes your job easier with the all new LJ3200 desktop air jogger designed specifically for jogging laser printed documents. This Paitec LJ3200 is the improved version of the discontinued LJ3000 paper jogger. The LJ3200 is the same as the LJ3000 except for the addition of the on/off foot pedal, a larger blower/cooling fan, and improved electronic board. The LJ3200 laser paper jogger utilizes an anti-static ionizer and air cooling system to eliminate the wait time demanded from laser printed documents. Providing a steady stream of air to cool the printed documents, the Paitec Laser Jogger 3200 ensures proper jogging while also eliminating static build-up with the unique Anion ionization technology. Capable at running at a variable speed to suit your needs, eliminate wait times, and handle all weights of paper, cardstock, and envelops, the Paitec USA LJ3200 does the hard work, so you can focus on being productive. Buy your LJ3200 today and improve your workflow. Large Jogging Bin Holds Up To 2 Reams Of Paper. Powerful 3,000 Rpm Motor Quickly Jogs Documents. Shock Absorbing Feet Minimize Noise And Vibration. Four Air Stream Slots Provide Constant Flow For Cooling Documents. Works With 115 Volt Or 230 Volt Electrical Systems. Convenient On/Off Food Pedal And Adjustable Vibration Speed Control. Electrical: 115-230 Switchable Voltage. 2 Amps. Welcome to MyBinding video. Let's take a look at the LJ3000 Laser Air Paper Jogger by Paitec USA. To jog your papers in place and remove all static electricity, there's no simpler method. There's an on/off switch and a dial for intensity. It works by drawing air through the fan in the top and blowing it up through the slots into the paper. This is the ionization process that removes static and cools your papers after printing. The LJ3000 can handle up to two reams of 11?17 paper. The adjustable vibration speed control knob gives you control over your job. In this demonstration, we're using fresh out-of-the-box glossy printed brochures. The vibration assists in jogging everything in order so it's nice and square, settling it down into the corner. And the air and the ionization process removes static and cools paper. To cut back on the noise, the machine has four different feet that are rubber and mounted on springs. 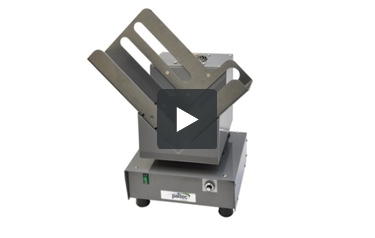 The LJ3000 is perfect for preparing documents for paper folders, folders inserters, bulk mailings, and pressure sealers. So keep it static free and in order with the Paitec LJ3000. For more demos, reviews, and how-tos on this product and many more, check out MyBinding.com.